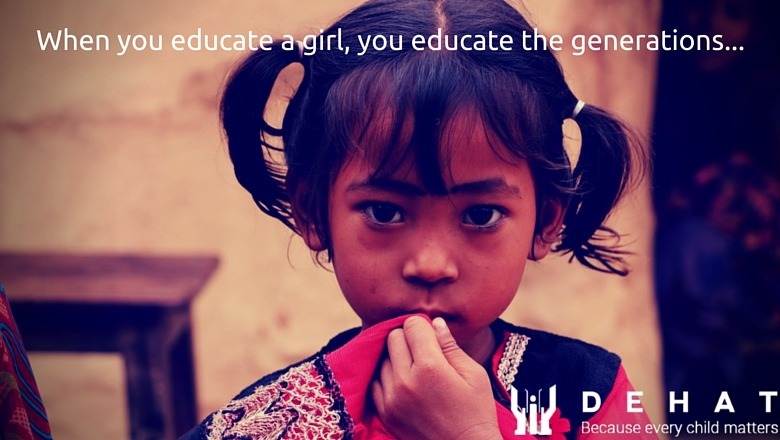 Malala Yousafzai supports the Girl Child Education, will you support us to make this a movement? 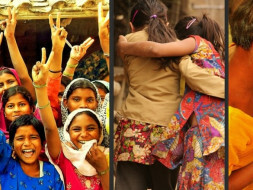 Girl Champs who are born in ‘hard-to-reach’ demographics, where facilities like schools are at least more than three miles far from their households and a society where they have been declared as ‘Socially Excluded Groups’ which nearly implies the end of their hopes. Meanwhile, in day-to-day life, Girl Champs are often denied of their Rights of Participation, Development & Protection. Furthermore, the community’s mindset is limited, offering more and more opportunities to their boys as he can help them to earn their livelihood and denying the hopes and desires of their Girl Champs. In their eyes, she can only be the core helper for their housekeeping work and later in the huge responsibility of her marriage (Parents were accustomed to marrying their Girl Child even earlier than 13). If we combine these problems together, we can have a better idea what can be the consequences of this wretched situation all together. Girl Champs, while fighting for their basic rights in their lives, can rarely get the opportunities to relax, wonder and simply enjoy themselves while learning more about the world they live in. There is a marked lack of encouragement, inspiration and awareness of the multitude of possibilities that await them in society. We believe that Champ’s demographics cannot be the indication for her destiny. Every champ deserves a chance to experience a whole new life, filled with opportunities to take full advantage of themselves and learn new things while building self-confidence. 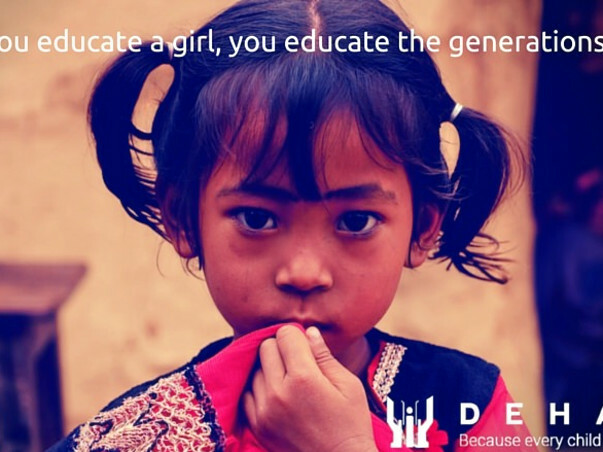 This belief is what inspired us to create the ‘Invest In Beti’' Initiative. 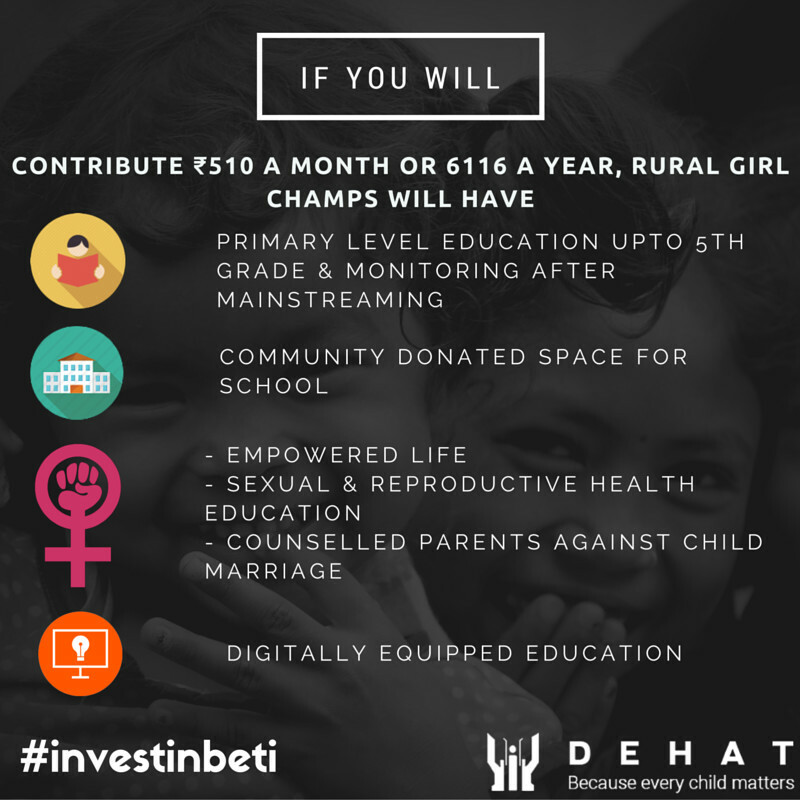 'Invest in Beti' seeks to bring quality primary education to villages where girls’ education is otherwise forgotten or ignored. 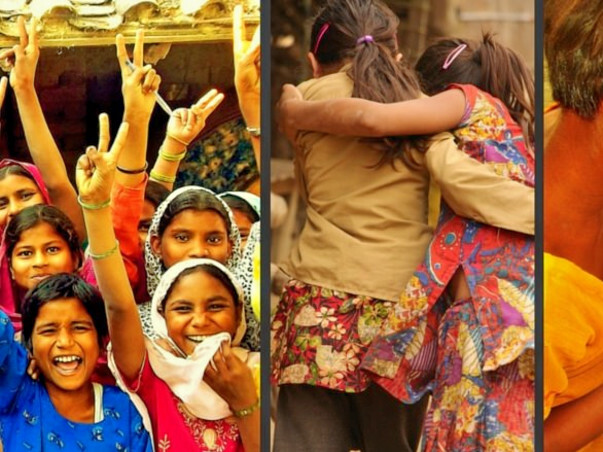 We operate alternative learning centres where girls from 1st to 5th class learn subjects including Math, Social Science, Science, English and Hindi, as well as important knowledge about nutrition, adolescent health, and all their deserving rights. These learning centres are also a safe shelters for girls in these villages, where they can receive counselling against the harms of child marriage or child labor and seek support of their teachers to oppose violations of children’s rights. Through these learning centres and organizations of parents, teachers and community leaders, we hope to empower both the girls studying in our schools and to expand opportunities for these women long into the future. The unique side of this program is that all the centers are operated in ‘Community Donated Spaces’ and also managed by a community constituted by the community. Through project ‘Invest in Beti’ we not only educate our Girl Champs to the limits of ABCD and writing their names, but we often provide an incredibly innovative environment, which not only allows them to get a primary-level education but also develop themselves in a setting where they can show-up their talents like singing, drawing, creating rhymes and writing poems etc. Meanwhile, since it’s a core program for adolescent groups, we offer to them participation in the dialogues in and interactions with issues like Reproductive Health Rights, the consequences of Girl Child Marriages, Trafficking Hurdles in different entertaining ways. These may become challenges in their lives due to extreme poverty. The only thing which allows us to achieve these ‘Changes’ is Community’s Behavior Change. 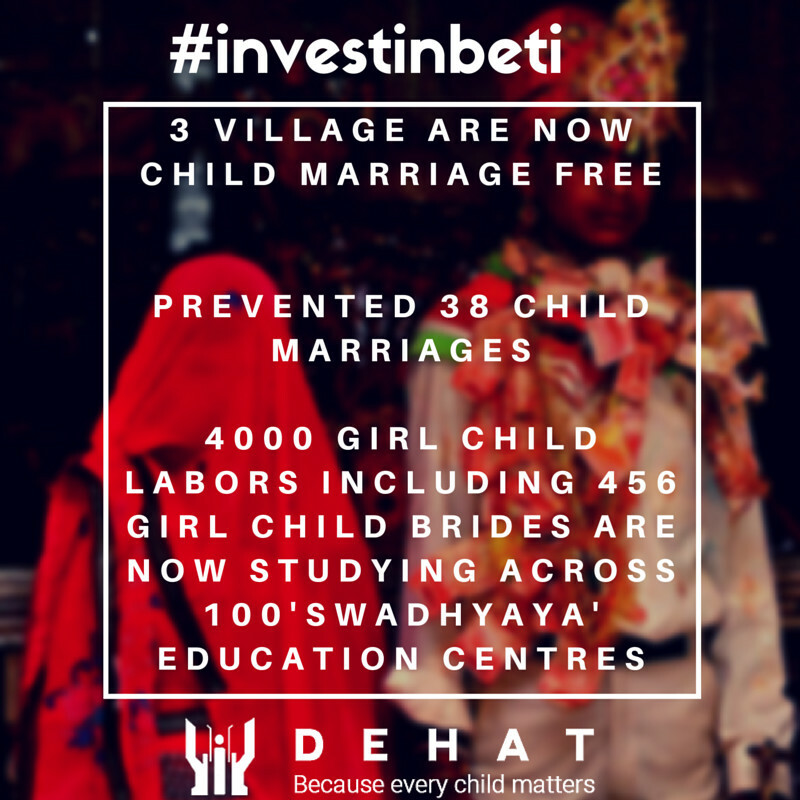 Project Invest in Beti is something different that we’ve introduced to take up these challenges in an incredibly new way. We have not bounded our teachers to the classrooms but also have involved them in door-door-to counseling of parents of the Girl Champs. Committee for Girl’s Right to Education meetings : For building support for girl child education and increasing community involvement with the learning centers. Teaching Learning Materials : Classrooms uses a variety of learning materials including wall paintings, chart, games, songs, poems, and activities to make girls’ education engaging and multidimensional. One-on-one parent contact : Home visits and parent-teacher meetings connect staff with students’ families and homes. These visits have convinced parents to reduce household chores, increasing regular school attendance by 25%.Teachers also learn about potential marriages, allowing them to counsel families against child marriage and for continuing girls’ education. Girls Mentoring Girls programme : The girl child plays the role of a teacher on a rotating basis, where they mentor gradual level girls and build their confidence and knowledge by teaching peers. Teacher trainings : Training sessions throughout the year, shared lessons and teaching tools with all teachers and support staff. Teachers were advised on the use of engaging teaching materials like flash cards, color charts, word matching, and peer teaching, which they have implemented in their own classrooms. Art and Painting competition : For breaking outside normal school activities and expanding their creativity and imagination. Holiday celebrations : Students co-lab with teachers, pradhans, government officials, block pramukhs and other community members to share songs, paintings,and nukkad natak(street plays) in celebration of Independence Day, Gandhi Jayanti, Children’s Day and Republic Day, and learn about the importance of these holidays in the process. Community Celebration : Project staff organizes rallies, meetings, home visits, and workshops for World Women’s Day, World Hand Wash Day, Iodine Deficiency Disorder Day, and World Breastfeeding Week which benefits the students and communities with the knowledge and importance of these events. Review meetings : Fortnightly performance review meetings and regular meetings between project and support staff helped teachers and staff communicate with each other. Exposure visits : To let each girl introduce and explore the historic and geographical sites DEHAT organizes an exposure visit to Historical monuments to widen the knowledge base of the children. Staff and students from low-performing centers also have exposure visits to high-performing centers, allowing teachers to improve their own centers. Foreign student interactions : Students from American Universities interacts with a small group of students at our alternative learning centers, providing our students a chance to learn about the importance of education and gain inspiration from the interaction. Mobilization and registration : Dropout girls in target villages’ identification through door-to-door contact with families and student registration to continue their education. 98% girls who took board exams with coaching center support passed with good ranks. Honored as first runner up for the Dasra Girl Power Award, Education category. FAQs & What do I plan to do with the funds? All your answers and detailed budget analysis are given at bit.ly/swadhyaya-initiative only. 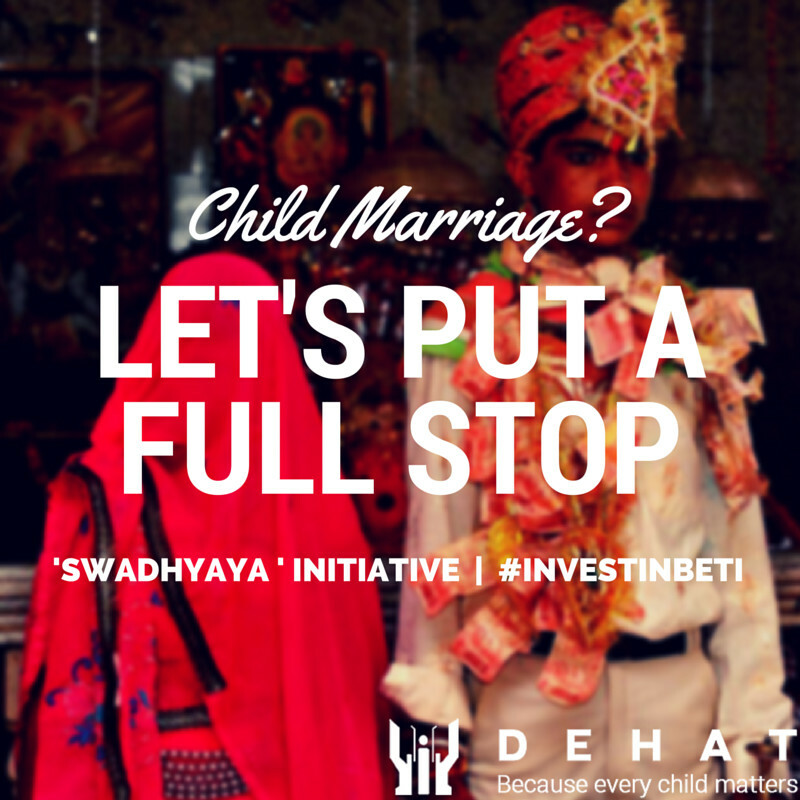 If you still have any doubt, inbox us at joinus@dehatindia.org or tweet @DEHATIndia or drop a message on Facebook at DEHAT-Because every child matters! Bahraich & Shravasti District of Uttar Pradesh. Girl Champ will graduate as a change maker for her family & community. Will be mainstreamed for higher education. Will have a brief knowledge about her Sexual & Reproductive Health Rights. Will be prevented from child marriages, trafficking and child labour. If you choose to donate entire annual running cost for one centre, your name or name of your company or your most beloved elderly's name will be mentioned on the signboard as Diamond, Golden, Platinum, Silver,sponsor (depends on amount you want to contribute). If you donate a part of this initiative, your name will be displayed in the donors list displayed at centre. You can meet your sponsored Champs anytime. You will be updated with their progresses. >Submit your request for cheque pickup here. >Submit your request for cash pickup here. The cheque should be in favor of 'Milaap'. 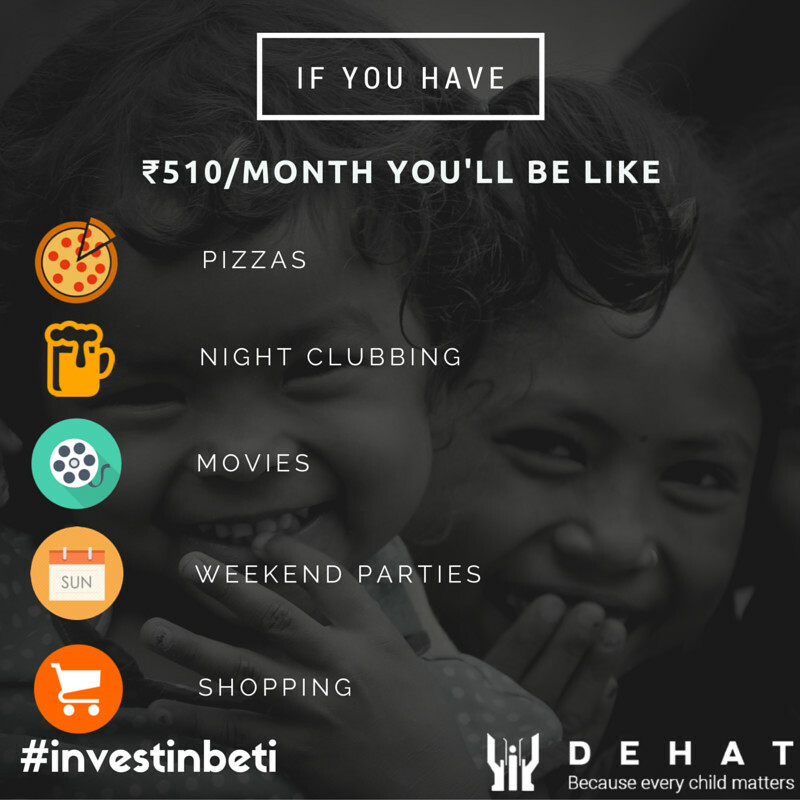 On the envelope, please mention the name of campaign- Invest In Beti-DEHAT-Because very child matters! Thank you Amit for such generous support! You've gifted almost one month education expenses for a girl child, we'll keep you in loop, once the learning centres are opened! Please share the campaign to double your donation impact! With your support, 23 girls we've opted in 5th grade have now passed their 10th grade with 65-81% this year! Thanks for your believe in DEHAT!